From Goodreads ~ Fifteen-year-old Jakub Kaminsky is the son of Polish immigrants, a good Catholic boy and a graffiti artist. While his father sleeps, Jakub and his best friend, Lincoln, sneak out with spray paint to make their mark as Morf and Skar. While Jakub’s future is looking bright, Lincoln’s gets shady as he is lured into his brother’s gang. Jakub watches helplessly as Lincoln gets pulled deeper into the violent world of the Red Bloodz. 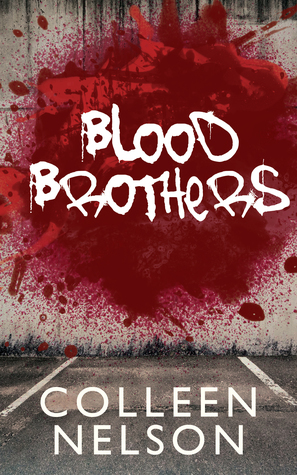 The Red Bloodz find out Jakub knows more than he should about a murder and want him silenced - for good. Lincoln has to either save his friend, or embrace life as one of the Red Bloodz. Jakub and Lincoln are fifteen years old and have been best friends for ten years. Neither comes from an affluent family. Jakub is living in a rooming house with his disabled father, who is a Polish immigrant, and Lincoln lives with his parents and younger brother and is First Nations. At night they sneak out and are talented graffiti artists. Jakub's priest helps him get a scholarship at an elite private school. He doesn't want to go because he doesn't want to leave Link behind. But once there, he enjoys and appreciates the opportunities. Around this time, Link's brother, Henry, is released from prison and hangs out with his gang buddies. Without the support of Jakub, Link is attracted to the money he can make by being part of the gang. Things get out of hand when Link gets involved in stolen cars and murder. This is the first book I've read by this author and I enjoyed it. It is written in first person perspective in Jakub and Link's voice (the chapters alternate and are labelled). Though it is a story about two fifteen year old boys, I didn't find the story too immature and would recommend it for mature young adults and older. As a head's up, there is swearing and violence. Thanks for your review of my book, Teena! I appreciate it! Thanks for visiting, Colleen! I enjoyed the book.